What is cultural heritage, how important is its protection and enhancement, and above all, how important is it that its conservation is “alive”? Key themes, underlying the intense work which led to the creation of Bologna’s new Tempio piccolo (small synagogue), which was opened earlier as part of a day destined to remain stamped on the memory of the Italian Jewish community. These themes were also central to the round table which followed, on Jewish Law and Architecture, moderated by the Editorial Director of the UCEI Guido Vitale. Speakers at this prestigious conference on the topics of the day were Rav Alberto Somekh, a rabbi in Turin and director of the Margulies-Disegni rabbinical school; Andrea Morpurgo, architect and architectural historian, lecturer at the IED Master Madrid, and author of Il cimitero ebraico in Italia (ed. Quodlibet); Giuseppe Costantini, a restoration expert who was a leading figure on the project for this new synagogue; and Rony Hamaui, economics lecturer at the Università Cattolica, Milan, and author of Ebrei a Milano (ed. Il Mulino). The discussion offered many new perspectives, starting with the challenge of fundraising, and the need to propose high-level projects as a crucial condition for financial backing. Wrapping up the conference, Daniele De Paz, the local community’s President, was keen to stress that “developing projects such as the one presented today is fundamental for preserving past heritage, but also for building the future of our communities”. And it was De Paz himself who opened the day’s proceedings, at a packed new Temple. 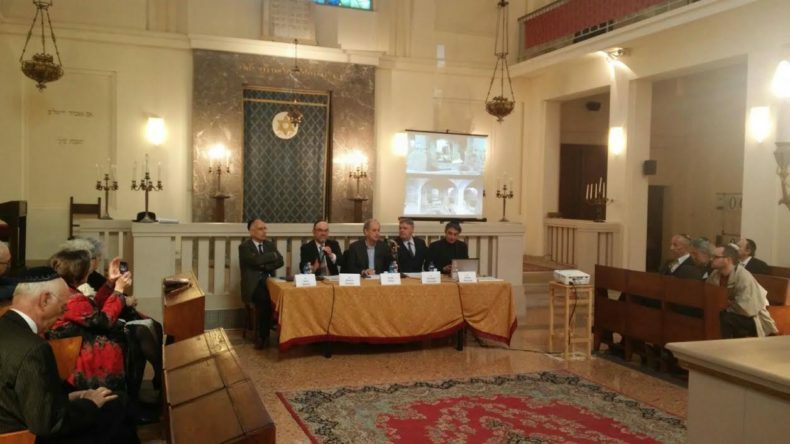 Other speakers included the UCEI’s President Noemi Di Segni, the President of the Italian Foundation for Jewish Cultural Heritage Dario Disegni; and rabbis Alberto Sermoneta, Giuseppe Momigliano and Adolfo Locci. Also present in the crowded hall were the UCEI’s vice president Giulio Disegni, the Jewish community’s councillor for Bologna David Menasci, and council members Vittorio Mosseri and Roberto Israel.